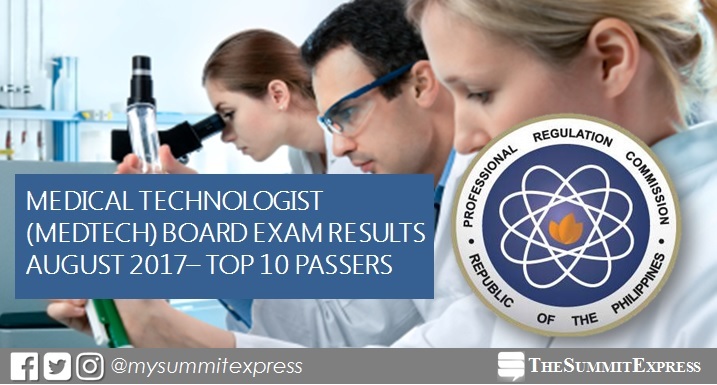 MANILA, Philippines - The full list of topnotchers or top 10 passers for August 2017 Medical Technologist (Medtech) board exam is available on this page as officially released this Thursday, August 31, 2017 or in three (3) working days after the exam. The Professional Regulation Commission (PRC) conducted the second board exam for medtech this year on August 26 and 27 in the cities of Manila, Baguio, Cebu, Davao, Iloilo, Legaspi, Lucena and Tuguegarao. In the August 2016 licensure exams, Roselle Louise Luga Publico from Silliman University (SU) topped the board with 91.10%. It was followed by Clarisse Joan Ceriales Cadano, also from Silliman, after garnering 90.70%. In the September 2015 tests, it was a triple tie between El Marie Tuazon Salunga (Angeles University Foundation), Jonan Michael Tan Soriano (Far Eastern University - Manila) and Brylle Domerson Mendoza Turalba (Saint Louis University) for the top spot, all having 90.70%. Here's quick summary of topnotchers for RMT exam in the past three (3) years. From which school will be the topnotcher for August 2017?